Scraping the sky at a lofty 450+ metres, the Petronas Towers may no longer be the tallest buildings in the world, but they remain an impressive feature of Kuala Lumpur, the capital city of Malaysia. Some of the action in the book for the Malaysian leg of my reading challenge takes place here. 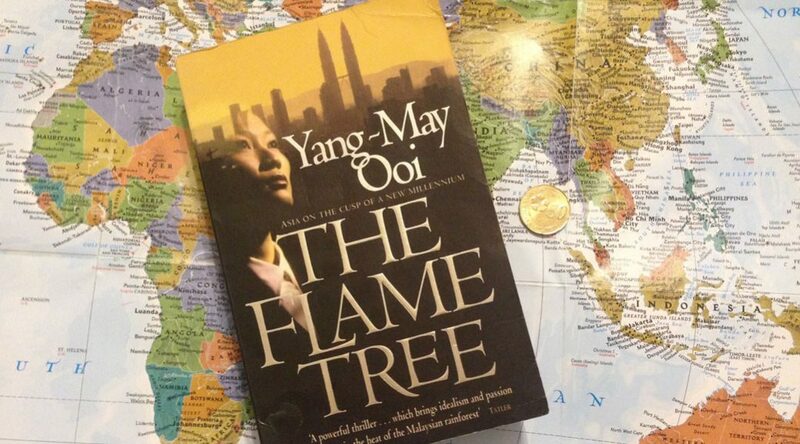 The Flame Tree, by Yang-May Ooi , centres on Jasmine Lian, a high-powered London-based attorney who seemingly has it all. Her latest project involves representing a firm bidding to win a contract for the construction of a sprawling new university town in the Malaysian rainforest – taking Jasmine back to her homeland, her mother, and an estranged friend. Admittedly this was not my favourite read. Due to the environmental ramifications of the new town, I thought environmentalism would be a key theme in the story, but it’s really just mentioned here and there. The displacement of the local population plays a bigger part, but is ultimately overshadowed by Jasmine’s personal woes. Furthermore, Jasmine, although quite irritating, is just about the only character with some depth. Almost everyone around her panders to stereotypes: the good guys have no flaws, and the bad guys have no redeeming features. The other exception is her mother, who is undoubtedly the best character in the story. However, the fast pace, mad chases, and dramatic action turn it into quite a guilty indulgence. Every time I picked up the book I felt like I was tuning into a favourite soapie or reading a treatment for an action blockbuster. On that latter note, the action sequences are very well written. These can be tricky to write, because if not done right, they can turn out either flat or confusing. It may not have been the kind of book I would normally read, but it gave me the opportunity to explore another genre, while exploring the world.